The maternal bond between baby and mum is a hard act to compete with and it starts to take shape way before baby is ever born. Nine months of breathing the same air will do that I suppose! You’re already as close as humanly possible but are there any other ways to make the most of these months before they’re out and a little louder with their demands? We’ve pulled together a top five list of bonding techniques so that by the time the birth rolls around, you’ll be best buds. You’re not the only one who enjoys a good massage. Some mothers and their partners massage the bump to get their baby used to human contact before they’re born. Gentle movements used after the third trimester are a safe and relaxing way to get some quality time with your little one. Some mothers like to add oils or creams into the routine to combat stretch marks as they spend time with their baby. If you really want to kick the relaxation up a gear then why not try an aromatherapy massage, it’s a tried and tested way to switch off and really get in touch with the life happening inside you. Any exercise that helps you to unwind and return to the moment is a sure-fire way to feel connected to your baby. 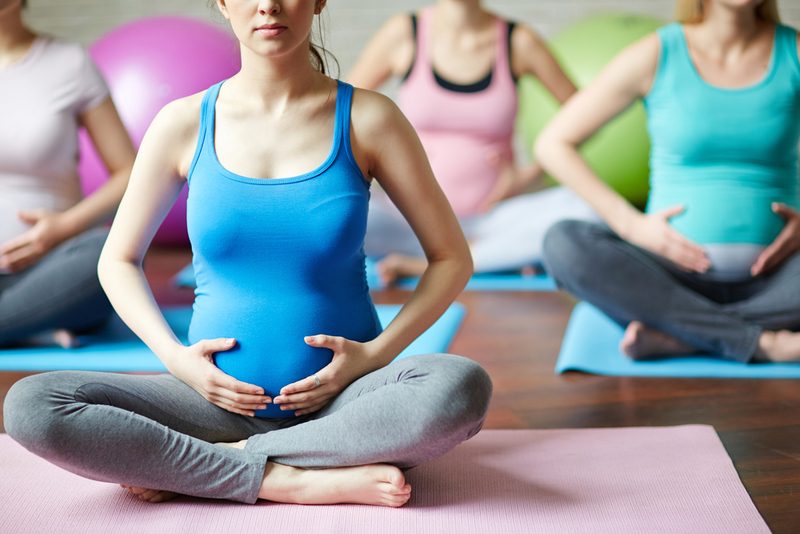 Prenatal yoga is tremendously beneficial for you, your changing body and your tiny baby. Some teachers practice a method called ‘breathing for two’ which is a breathing technique that increases oxygen flow to you and your baby. Breathe deeply with one hand on your chest and the other on your belly. Now visualise the air being sent right down to your baby. Getting familiar with yogic breath can also prove invaluable when you go into labour and need everything to slow down a bit. Breathing during labour also helps to relax the body enough for the contractions to do their work. These nine months can fly by in a haze of baby scans and bathroom breaks, so it’s a really nice idea to log your journey in a pregnancy diary. Capture how you’re feeling towards your baby as you get closer to the finish line. This not only gives you a lovely keepsake but it also gets you to pause and reflect on how you’re feeling- always a good thing during this transformative time. Some devoted mothers hang on to the diaries until their baby is all grown up enough to have it read to them. It’s a lovely way to show how much they mean to you right from the very beginning. It’s much easier for us to form a connection with something when we can visualise it clearly. Research has shown that baby scans help the mother to see the pregnancy as a reality which helps them to prepare mentally for the birth as well as feeling more connected to the baby. Remember, baby scans aren’t like other medical documents that need to be carefully filed away- show them off, loud and proud. As a gorgeous reminder of the beautiful thing that’s happening inside of you, keep the picture somewhere you can see it regularly- on the fridge or next to your computer in work. If you really want to get the full picture so to speak, you can push the boat out and have a 3D or 4D scan done at around 26-30 weeks. These scans are incredibly detailed so you can really make out baby’s features, but, some things are better left as a surprise on the day. Once you’ve built those unshakable bonds, it’s time to keep those little crawlers safe. Check out the interactive first aid demo for parents of new babies and kids under 5 at our Pregnancy & Baby Fair, in the RDS 29th and 30th of September.